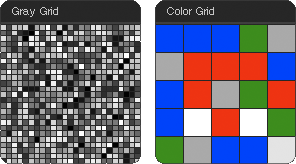 UI Object that displays a grid of elements based on the two-dimensional output from a module. The colors from the supplied list of colors or color table are used to draw the values in the range 0..max. Note that the use of this object has changed since version 1.0.
color color list or color table "LUT_fire"
drawonce should the grid only be drawn once; set to "yes" to activiate "no"